Squeeze hard! It's the dollar that makes him holler. Buy a bond to-day! 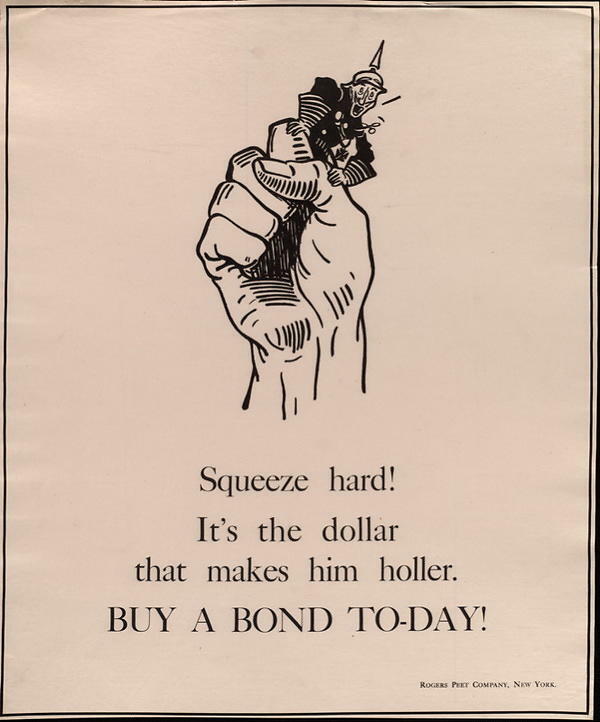 During World War I, state-sponsored images of raised, clenched fists appear in posters promoting the purchase of war, or “liberty” bonds. Printed in the decade after the socialist use, this poster insinuates that the visual power of a raised, clenched fist was not only meaningful to fringe political groups. Rogers Peet Company, “Squeeze hard! It's the dollar that makes him holler. 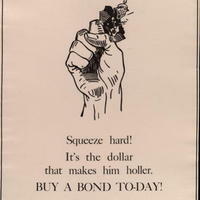 Buy a bond to-day! ,” The Fist is Still Raised, accessed April 25, 2019, http://raisedfist.femmetech.org/items/show/18.